A visit to an antique store is akin to a virtual journey back in to the past. 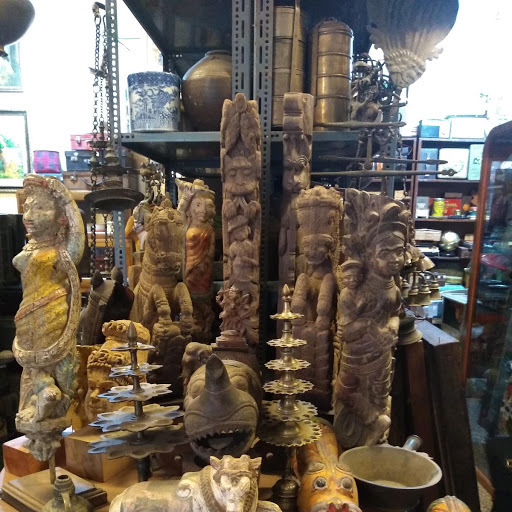 The antiques are like treasures ushering you back to childhood or to some medieval period where making intricate sculpture designs was a piece of cake. 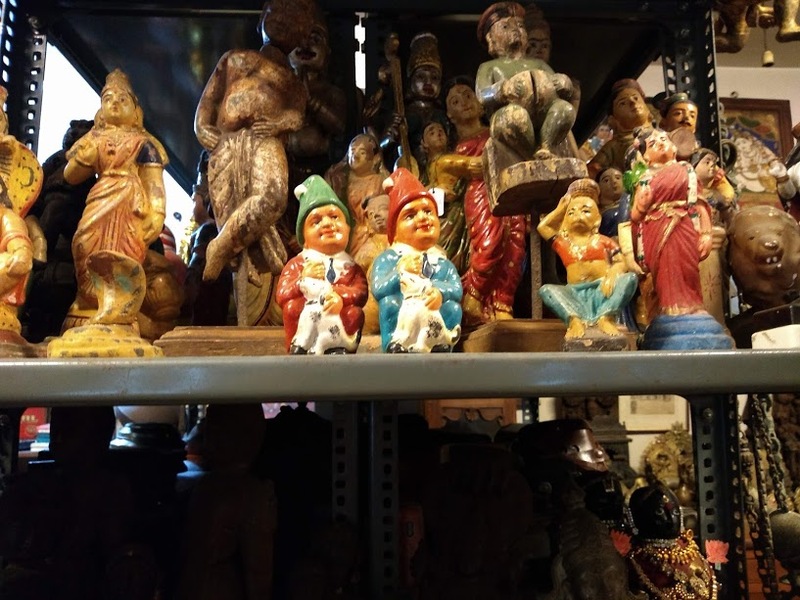 The brass,bronze figurines, wooden toys, collectibles and records at such stores with their rustic charms have a story to tell and are important pieces of history as well. 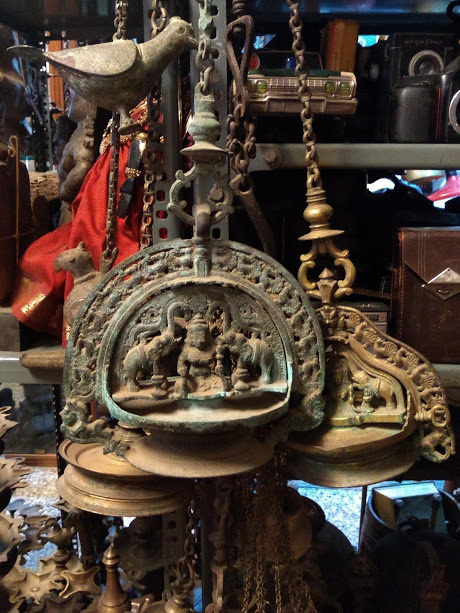 A similar experience awaited me last week when I popped in at Balaji Antique Store at Avenue Road. The neatly stacked tin trunks,the compact jewelry and medicine boxes, the row of porcelain dolls brought back memories of childhood. You see my grandfather had a heavy trunk kept in one of his numerous rooms. Stacks of fold able beds were kept on top of it. And when guests came, the beds were removed one by one. I could now get my hands on the trunk and it was a secret delight to pry open its lid,peek inside and check out the pretty China head dolls, old chinaware, medicine chests etc. The China head dolls were my favorite. The antique dolls were made during the period 1836-1940 by German Companies. The nicest thing about them – some of them had painted hair and movable arms. These china dolls are dated according to their hairstyle, say if it had a center parted hairstyle, it was probably from 1830 and if it had long curls at sides, it would reflect 1840 and if it had headband it would be 1860 and so on. 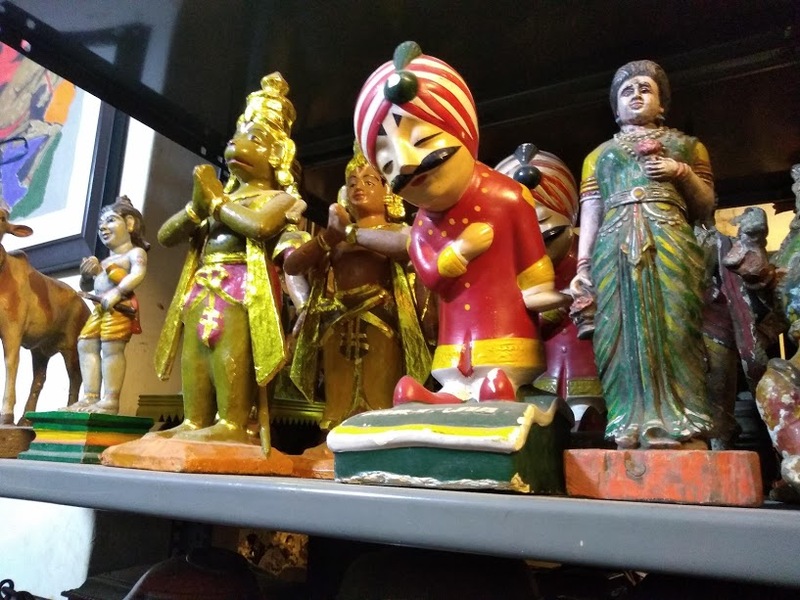 Next my eyes fell on vintage Air India Maharaja Statue. The Maharaja was created in 1946 by commercial director Bobby Kooka and Umesh Rao , an artist. The Maharaja was the mascot of Air India at a time when air travel was considered luxury travel- a symbol of high living. The Maharaja traveled all over the world rescuing damsels, wrestling, being a monk, an artist etc- in other words living fully and reaching out from all parts of the world. Today the image has changed-the Raja has a leaner, sportier look. Murphy Radios with its dials and knobs next caught my attention. Founded in 1929 Murphy Radios was a British Manufacturer of radio sets that used to supply to the British Army as well. One of their important contributions was the wireless set No -38- a transceiver used during world war -II. 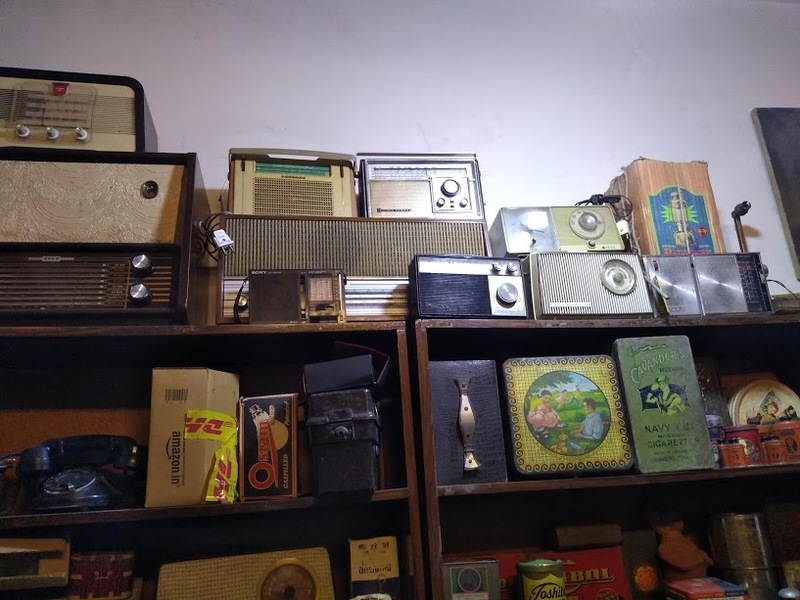 Apart from spy cameras, radios and gramophones, vintage Brass lamps and bronze figurines fill nooks and corners of the store. They are ancient, rustic yet charming and I wonder which is older- Brass or Bronze. 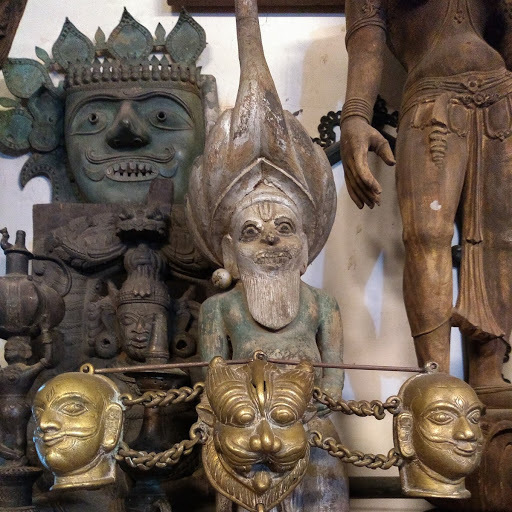 ‘ Bronze items are older perhaps from 8-9th century’, explains Balaji , the owner when asked. Brass, an alloy of Copper is more malleable. 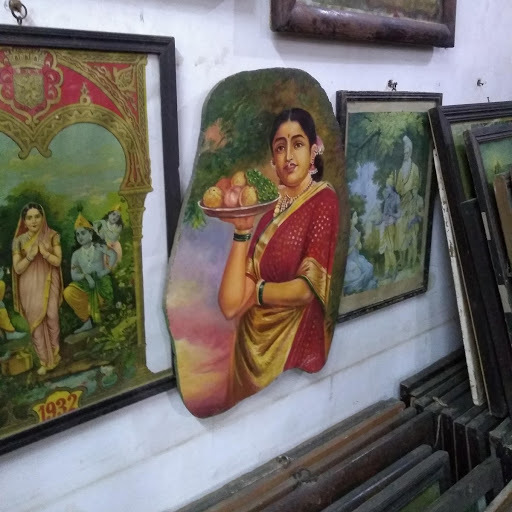 The lithographs of Raja Ravi Varma are displayed on the walls. The art of Ravi Varma was not restricted to Kings. He did paint for the royalty- Kings of Mysore and Baroda were some of his patrons but he established a lithographic press in 1894 and made his paintings accessible to all. From posters to calendars and frames his paintings got widely circulated. 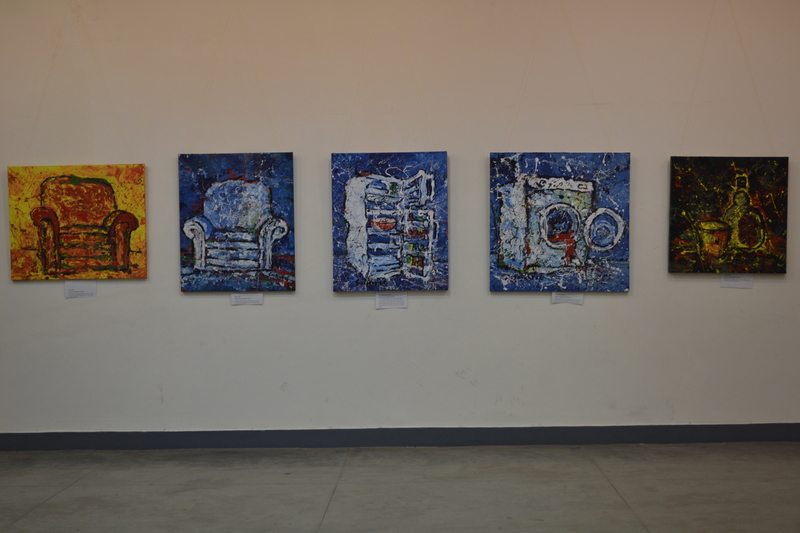 However this resulted in his art being copied as well by artisans from various parts in the country. Apart from these items there are collection of watches, cameras, wooden furniture, bronze artifacts,old film posters in its three rooms. All of them overflow with antiques and are a delightful way of spending your mornings or afternoons. 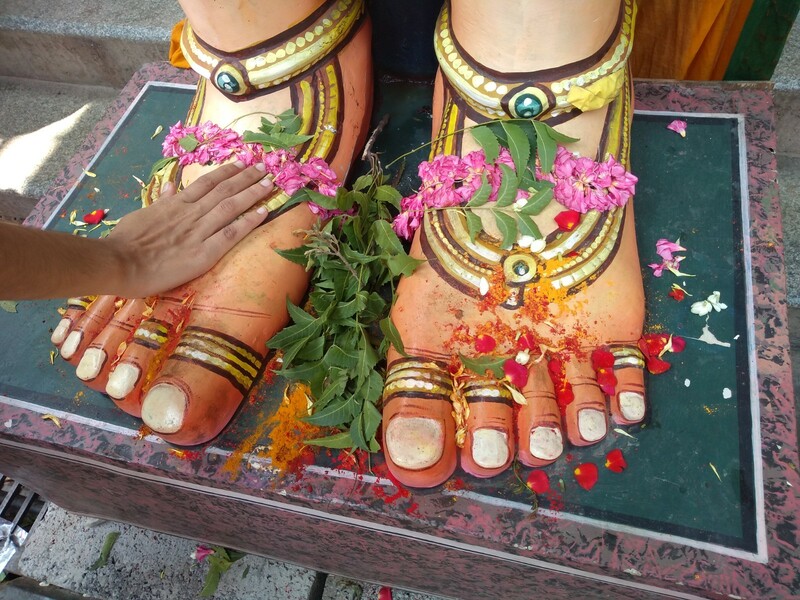 The owner Balaji is a treasure trove of information and will regale you with delightful nuggets of information. 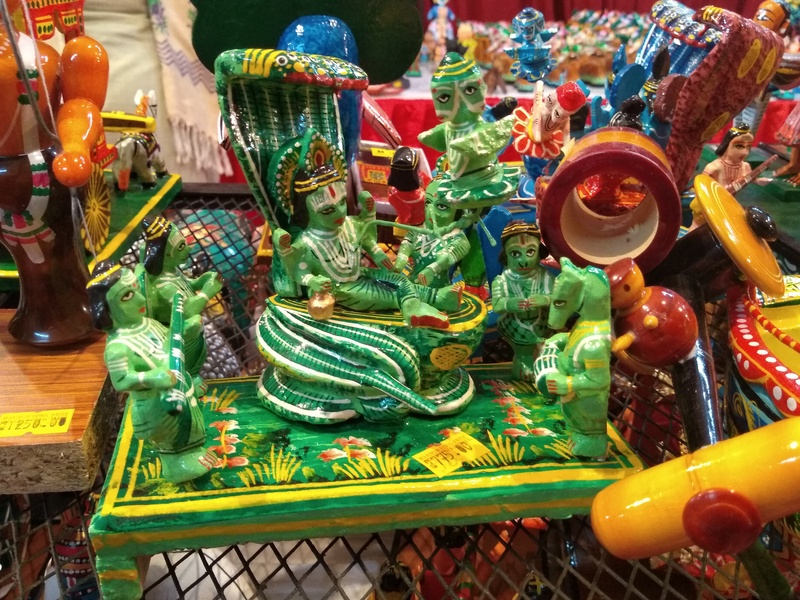 Do you own a Palm leaf Pattachitra? There is a sense of pride in the artist’s eyes. He is explaining to me what it is to possess a Tala-Pattachitra. ‘ It is a legacy you are acquiring madam, a priceless masterpiece that does not fade and which occupies a place of pride in your home. You will be proud to pass it on to future generations,’ he insists. He is talking about his creations, the Palm leaf engraving- Tala-Pattachitra from Orissa. His pride makes me feel strangely happy. You see, he is talking about an ancient Orissan palm leaf art – perhaps a thousand year old heritage from Orissa and Indian heritage is something I am rather cocky about. The creations are all done on Palm leaves. The fine drawings are from manuscripts. 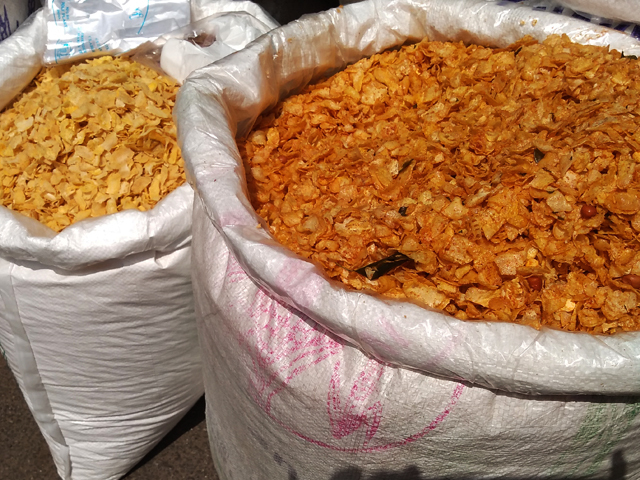 The details could be from mythological tales like Ramayana, Mahabharata, tales of Lord Jagannath of Puri temple…. But what makes them striking is that a thin stylus made from iron called Lekhana is used to engrave these illustrations. The artist or the Pattachitrakar as he is called, definitely requires a skilled and steady hand!They are so fine and detailed. I see the engravings dyed in a striking black color. And I ask him how they color these fine line drawings. To which he replied,’ Madam, we rub the palm with a black dye or soot or charcoal powder. The areas that don’t require the color are rubbed with a piece of wet rag.’ The color now becomes a part of these creations. Soot from the hearth , straight in to the handcraft! The engravings are done in a single leaf- more often in four to five leaves or even more and stitched together.The result could be a scroll with a flap that neatly show off the illustrations and perhaps even a verse or two. Orissa has a rich history. Though it comes in our history text books in the notoriously popular Ashoka- Kalinga war, it was an independent State before, that proved a formidable opponent to Mauryan dynasty. Over the centuries it has been ruled by various rulers -Samudragupta, Harshavardana, Gangas etc. It came under Mughals, the Nawabs of Bengal ,Marathas and the British too. Culturally it is a potpourri of various religions- Buddhism, Jainism, Hinduism and the heterogeneous tribal religions as well. This is reflected in their arts and crafts. 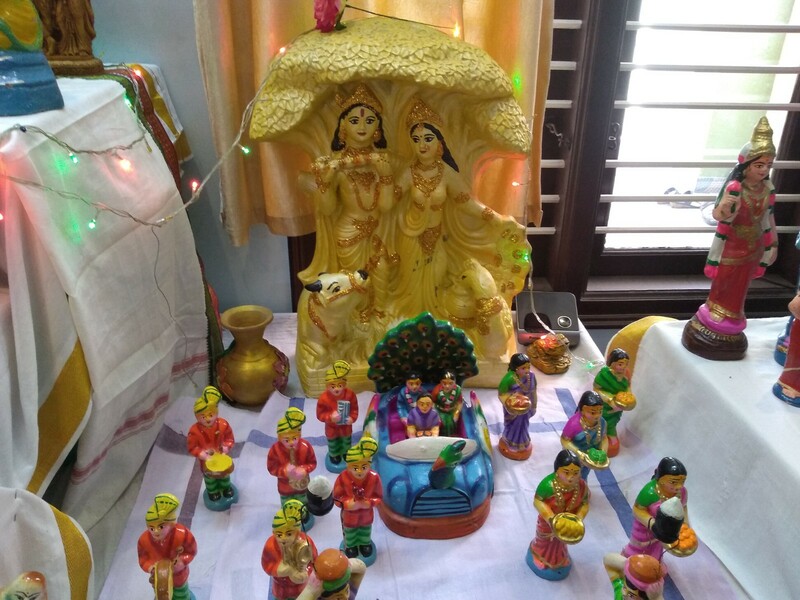 The Patachitra or the palm leaf art and illustrations depict this medley. Originally the Tala-Pattachitra was created by the Nayakar community. They were astrologers and used such palm leafs to create birth horoscopes of newborns. 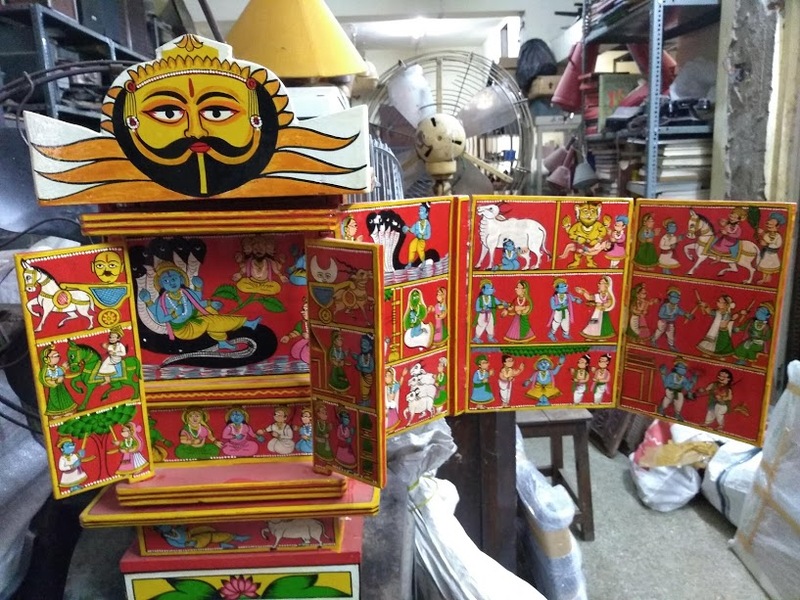 Today this art-craft is seen in the state of Orissa especially in Bhubaneshwar, Ganjam,Puri and Raghurajpur regions. And it has adapted to the changing times. The palm leaf now sees itself as wall hangings, lamp shades, fans,bookmarks etc so that it gels in to a contemporary home theme. 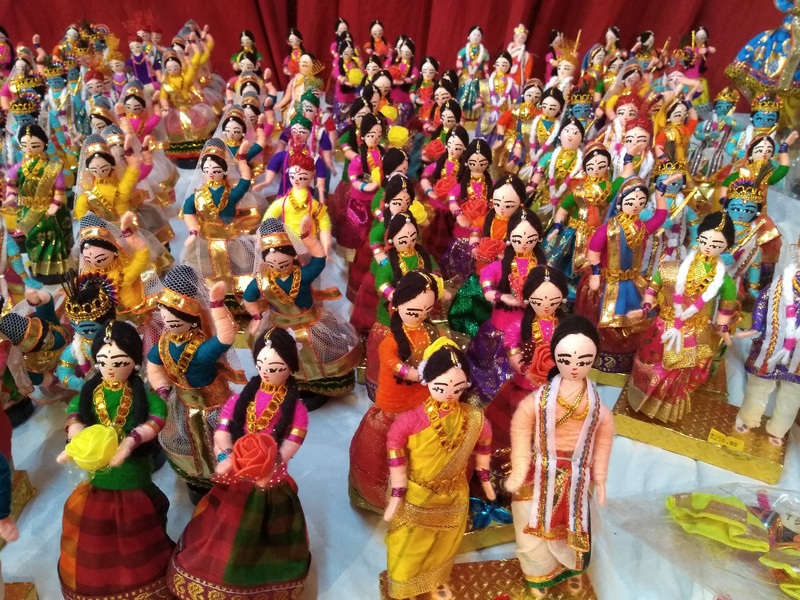 If you would like to know more about this art-craft then Karnataka Chitrakala Parishat is the place to be. Check out their art and craft section. Support the artisans by buying a piece of this heirloom. The other day at a prominent gallery, I came across a painting titled ‘ Shades’. One half of it was sketched in a dark color while the rest was painted a shade lighter. It was priced above 20000 Rs. And I idly wondered -I could have done such a painting too. 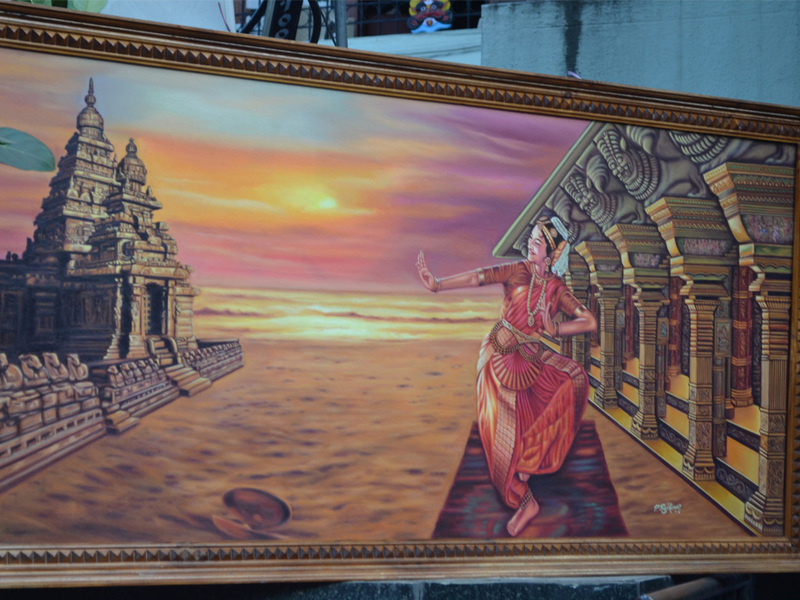 As I walked ahead, I stumbled upon a beautiful Mysore styled painting of a goddess. The rich colors, deep hues,intricate brush strokes – each detail was depicted to perfection and managed to convey a deep sense of divinity. The gold and silver works on the artwork further accentuated this feeling. I was stunned for a moment and I realized I was standing in front of a masterpiece. This is what I would call ‘true art’ was the feeling I came away with. However a few days later I had an interesting conversation with a hobby artist- a senior citizen who had been dabbling in art for years. And he changed my perception on art. “Modern art by itself may not invoke any form of awe. It might not inspire you with its beauty,richness or take your breathe away,” he said. “However if it makes you pause,ponder and invokes feelings, then the piece has done its job.” he explained further. I went back to the gallery and looked at ‘Shades’ again. I noticed a series of dark lines slowly growing a shade lighter , thinner, finally attaining a lighter tone. The painting that I had previously dismissed as a smear job now took on meaning. It was the artist’s way of conveying that each person had a dark side but with effort he could move towards his positive side. Did the artwork inspire me now? You bet, it did! Just to put things in context, art created during the period 1860-1960s is called Modern art. It does not stick to any boundaries, styles or themes. The art forms during this period tried to break free from the traditional art practices and tried to create something new. The goal was to build something original, to challenge the existing norms, to depict reality as is. Sometimes it made you uncomfortable striking you with questions that had no answers. Or the visuals may have a deep underlying social and political message. For instance the ‘White on White‘ abstract art form by Malevich ,a Russian painter. The painting was done during the 1918s – one year after the Russian revolution. The abstract talks about hope, freedom, change, the birth of a new society. In a sense it takes you back to the Russian revolution and the society then. So while the classic pieces like Mona Lisa and the paintings by Vincent Van Gogh can evoke a different sense of emotions, the Modern Art with its abstract paintings, Impressionism etc takes a different voice. So as a lay person it makes sense to see these master pieces in that light and not compare and think- just a painting by a con artist. It might just have a deeper meaning, you never know! The passion in the young chap at the Asian Arts Emporium was evident. He spoke about carpets as if they were living, breathing buddies of his. “Look at the colors madam. Just walk around and you will see the carpet changing color,” he gushed. This was true as I walked around the hand woven Kasmiri carpet, I could see it altering from dark to light shades. ” Isn’t it magic madam? 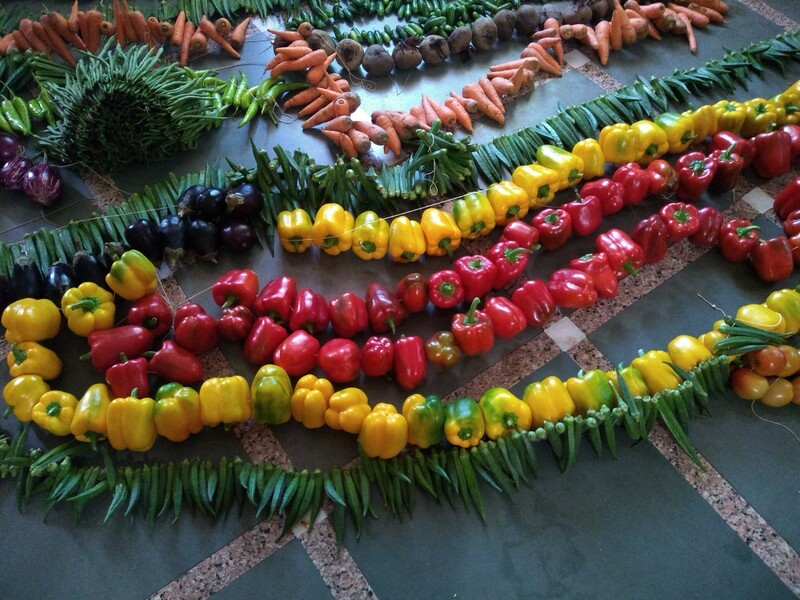 No machine-made rug can give you such results,” he said smiling proudly. Though it is unclear as to when the carpet weaving was introduced to Kashmir, it is evident that the artists were brought in from Persia to train the weavers of Kashmir. The Mughals were responsible for its growth in India. ” Each community in my village is engaged in the weaving. And each of their patterns are distinct,” said the salesman. The colors were subtle, the patterns were varied, some floral, some geometric in the numerous wool and silk carpets that he displayed. The oriental rugs can have varied patterns- flower motifs,trees, tribal designs, curvilinear/abstract, animal figures etc. This again is unique to the area from where it originates. While a good quality machine-made rug can last for 20 odd years a handmade rug is a heritage that can be passed down from generation to generation. The older it is the more expensive it gets! Plus rugs before the invention of synthetic dyes are truly antique and fetch a good value if you have the heart to sell it. 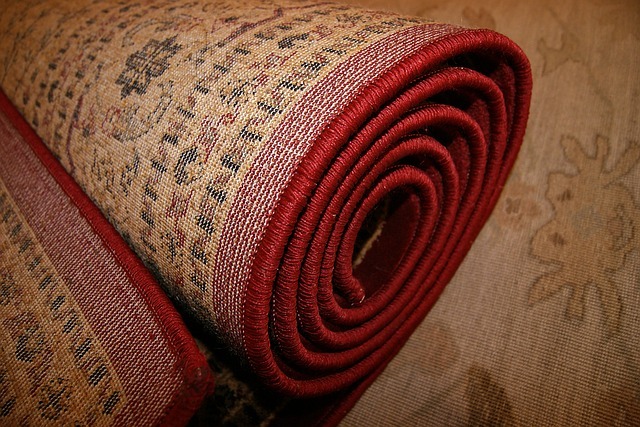 Dust generally causes no problem with handmade carpets. The pile is inclined, so it dusts itself off from the dirt. ” “Any stains can be easily removed from the carpet by rubbing lemon juice,” said the young chap. I didn’t buy anything because I could not afford the 50,000 Rs price tag attached to the handmade carpet. This is the only disadvantage that I could come up with, the price. Machine made stuff are cheaper. But money is a small factor to consider when you understand that it takes the weavers 7-8 months to prepare a carpet. So if you love collectibles and money is not a problem, then this is one heritage item that is worth possessing. My article titled Different Strokes’ was first published in Deccan Herald, Spectrum supplement in July 2012. A shorter edited version is reproduced here. Heritage is not just about stone sculptures or palaces. Poornima Dasharathi traces the history of paintings in the State, and discovers that they are full of rich and diverse themes. When we look at a Jaipur painting or a Mysore painting on the cover of a calendar or between the sheets of a diary, we just give it a glance as our eyes focus on the dates. The painting is pretty no doubt, but beyond that, it doesn’t register. However if we were to know that the painting was the skillful work of an artist a thousand years ago with limited materials such as a rock face as canvas or probably the only record that tells us how a king looked like, then we would better appreciate its significance and value. 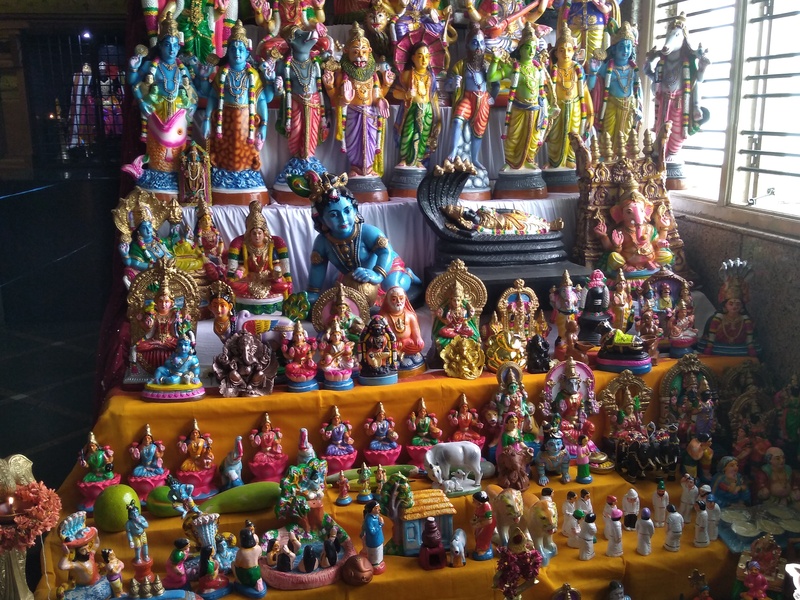 Art has flourished in South India much before the Christian era. As timelines changed, the canvas changed from the flat surface of caves (mural) to cloth and manuscripts (miniatures) and finally paper. The earliest example in the State are the murals in Badami caves. In the book, ‘South Indian Paintings’, the author Sivaramamurti attributes the beautiful murals in the caves to the time of the western Chalukyas, who ruled from sixth – eighth century AD. In the same style as that of Ajanta, the art was probably made during the reign of Mangalesa, the uncle of Pulakesi II and the brother of Kirtivarman. The ruler was a great patron of art and created some magnificent cave temples in his capital. One of the paintings that have been described by all scholars is a court scene where there is a central seated figure witnessing music and dance. Scholars think that the central figure is Mangalesa’s elder brother, Kirtivarman, for whom he had high regard. Though mostly obliterated today, the graceful figures and their beautiful jewellery remind one of the Ajanta murals. The local colours used were red, yellow, green, brown and black. The usage of blue came in the later years as it was imported from Persia, the author explains. From the 8th century until the 15th century, there are no samples of paintings in the State. 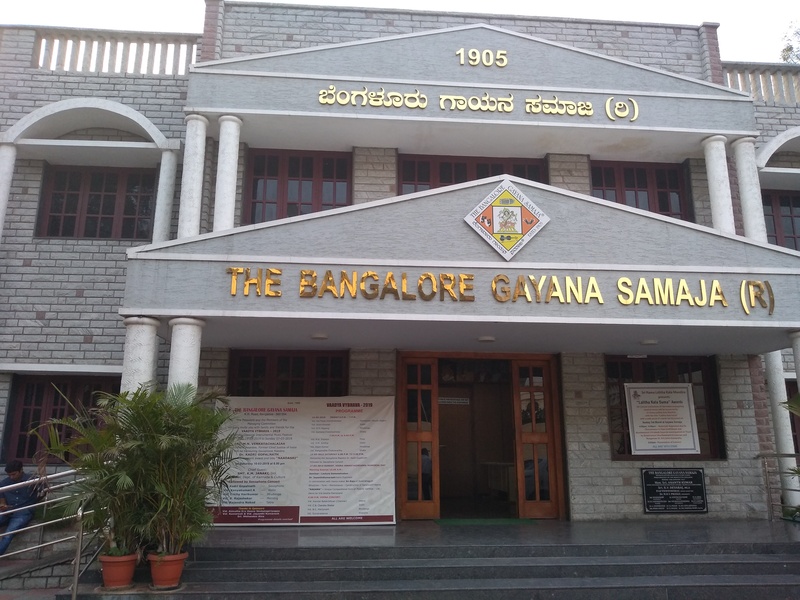 This is not to say that painting as an art was not promoted but examples of paintings have not been found, apart from just one discovery of palm leaf manuscripts from Moodbidri, based on the teachings of Mahaveera (Jain saint). The manuscripts use bright colours chiefly red, yellow and green and are exquisitely detailed. From the 15th century onwards, there are many records of paintings in south India. The Vijayanagara rulers revived Hindu art in their vast empire. Wall paintings decorated not only caves outside the capital but on every building in the cities. This fact is chronicled by Domingo Pais who visited Hampi during the reign of its most famous ruler, Krishnadevaraya. 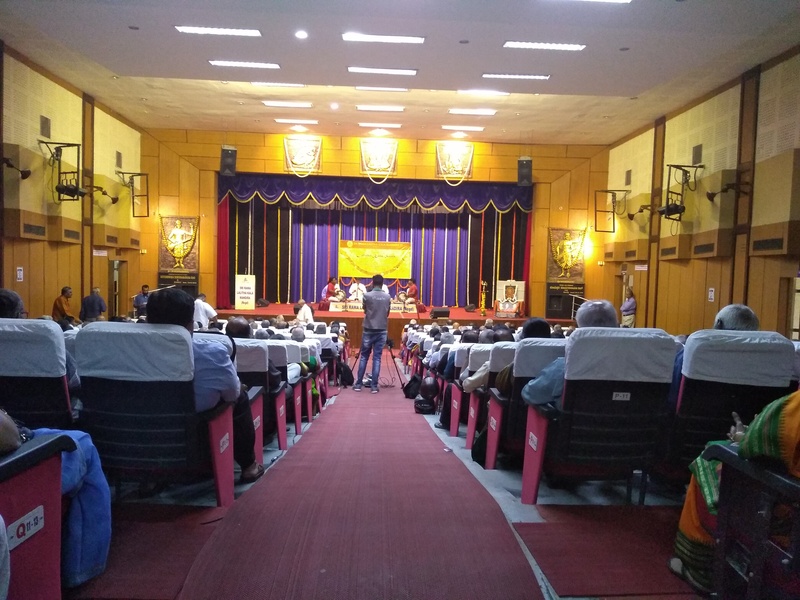 While he gives a glowing account of the city, what strikes one’s mind is an account of paintings on a portion of the palace which depicts the cultures of all communities including the Portuguese and other foreigners to Vijayanagara; the paintings are intended as a window to the Queens to know about the cultures of people across the world. Though the palace doesn’t stand today, Vijayanagara paintings can be found all over south India in fragments, Anegundi, Hampi, Lepakshi, Kalahasti, Tirupati (in Andhra Pradesh now), Chidambaram (in Tamil Nadu), to name a few. 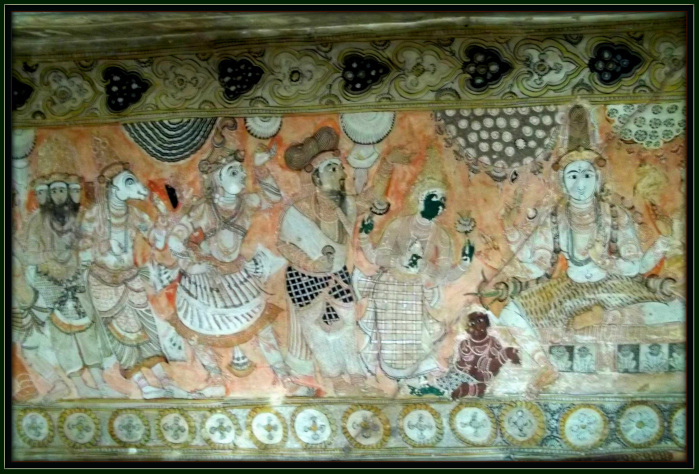 In Hampi’s Virupaksha temple, the ceiling of the mantapa has a series of paintings. One of the scenes shows the ascetic, Vidyaranya, the guru of Harihara and Bukka (founders of the empire), being carried on a palanquin and followed by a retinue. The Virabhadra temple at Lepakshi is home to some of the best preserved paintings of the Vijayanagara period. Apart from the exquisite temple architecture, the temple’s ceiling describes many stories of Shiva – Bhukailasa, Kirataarjuniya and the marriage of Shiva and Parvati – to name a few. The paintings are highly decorative; the highlight of the paintings is the exquisite textile designs and patterns of the clothes that people wore in that period. The ‘Deccan’ sultanates constituted the area that comprised north Karnataka, Maharashtra and northern Andhra. Of the five kingdoms, art flourished mostly in the kingdoms of Ahmednagar, Bijapur and Golkonda. The Deccani (Dakhani) paintings were largely influenced by Persian and Turk art. Artists came from Tabriz( in Iran) to the Deccan in 15th century setting the tone for the Deccani art narrates Mark Zebrowski in the book, ‘Deccani Painting’. However despite the foreign influence, there is an underlying Indian humanism, he explains. Persian and Indian fusion is also emphasised by A L Narasimham, noted art historian, in the book, ‘Nijada Kale’. He describes the miniatures found in an astrological manuscript, Nuzm ul Ulm, commissioned by Adil Shah I in 1570. The miniatures usually have a single character with blossoms and creepers that enhance the shape; the patterns usually seen in Persian designs. The Persian way of showing the faces at an angle is later changed to showing just the profile, he further adds. The Bijapur court which encouraged music also produced the earliest of Ragamala series of paintings. It is said that depicting musical modes through paintings originated in Bijapur. The Deccani style reached its zenith during the rule of Ibrahim Adil Shah II in Bijapur, says Aruni, ICHR. Ibrahim II was a great patron of art and passionately fond of painting, music and poetry. Zebrowski compares him to another great contemporary, Akbar. Like Akbar, he was fascinated by Hinduism; in fact most of his portraits show him wearing Rudraksha beads. Ibrahim gave his daughter in marriage to Akbar’s son, Daniyal; amongst other goods, many manuscripts and paintings went as a part of the bride’s retinue to the Mughal court. Some of the Bijapuri artists like Farrukh Husain also went on to work in the Mughals’ court. The Vijayanagara and the Bahamani kingdoms extended patronage to many European artists. Some of the earliest artists were Jesuits who drew scenes from the Bible, explains Narasimhan. He narrates the charming story of a padri named Bartholomew who presents a few biblical art works to Vijayanagar ruler, Venkata II, who ruled from Penukonda in 1600s. Amazed by the skill, the king orders the artist to create the same work in front of him. As the artist recreates the paintings, the king buys the entire collection and has it displayed in the court much against the wishes of courtiers. Another such story from the same article is that of an artist named Cornellius Heda who journeys all the way from Prague to India. Imprisoned by the Portuguese in Goa, he escapes and arrives at the court of Ibrahim in Bijapur known for his sympathy towards artists. He becomes the court painter and art advisor to the King. Post 17th century, there was a huge influx of European artists. As landscape artists were given patronage in India rather than Britain, many such artists visited India and created huge collections of landscapes, culture, everyday life, flora and fauna. They returned to their countries and sold these paintings of exotic East. After Tipu’s demise, there was a flurry of British artists to Mysore. The Daniel brothers who visited India and China created a portfolio of around 60,000 sketches! Many detailed paintings of forts, landscapes and hills were also commissioned by the British for military purposes. Mysore traditional paintings stick to devotional themes. There is an absence of realism and they are richly ornamental with the use of gold. Though this style was patronised by the Wodeyars, much of the Mysore school of art that has been found and described is only from late 18th century onwards, during the time of Krishnaraja Wodeyar III (Mummadi). 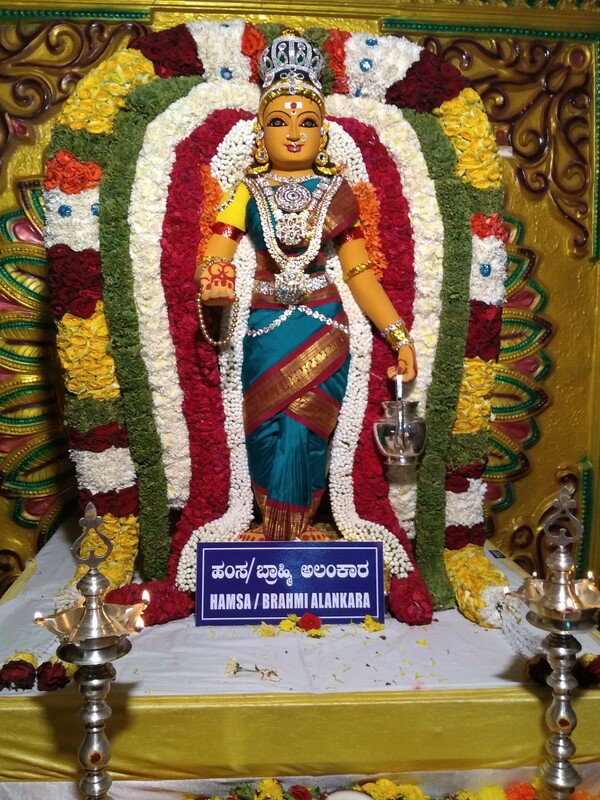 Some of the artists of this period are Javagal Narasimhayya, Naguvanahalli Naranappa, Patala Nanjudappa and Tippaji to name a few. Many works of the painters decorate the palaces in Mysore even today.